If you like this same art in a pink palette, go to art.com and look for art called Petal Power I and Petal Power II which come in a variety of sizes. Enjoy. 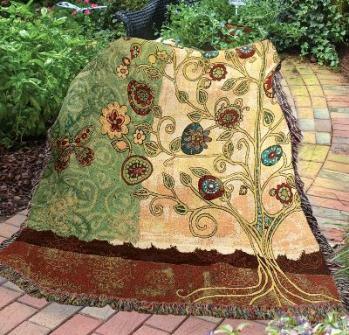 Here is another affordable, home-fashionable throw licensed to Woven Art and Beyond from my Gypsy Garden Collection. Flowers & Vase Jacquard Woven Throw & Pillow. Licensed art of ©Wendy Bentley, part of the Gypsy Collection. Bohemian style decorating is all about living simply and expressing one’s creativity throughout the design. It is influenced by the gypsy lifestyle. Throw Size 50″ x 60″. Machine wash in cold water, gentle cycle with mild detergent. Do not bleach. Tumble dry. 100% Cotton. USA Made. Pillow Size: 17″ x 17″. Spot or dry clean only. 100% Cotton. USA Made. There is also a great tapestry that is 26″X36″. Learn more from the link below. I am happy to present this beautiful and affordable throw and pillow licensed to Woven Art & Beyond. These are from my collection called Gypsy Garden, also known as Bohemian Floral for wall art. See description below or head over to http://wovenartandbeyond.com/gygawoartthw.html to see the many wonderful things Woven Art & Beyond has to offer. 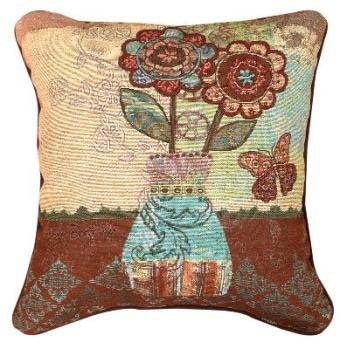 Gypsy Garden Woven Art Throw & Pillow. Licensed art of ©Wendy Bentley. This new Gypsy Garden Collection is an expression of Bohemian style. Bohemian style decorating is all about living simply and expressing one’s creativity throughout the design. It is traditionally linked with free thinking counterculture and is influenced by the gypsy lifestyle. Inspiration for this type of decor comes from the art colonies of nineteenth century Europe where musicians, actors, artists, and writers converged into avant-garde communities. 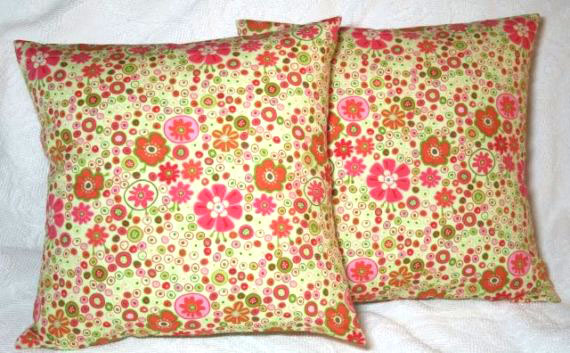 Sewgraceful Etsy Store has made some 16X16 removable covers with my Blossom Lane collection. Pillows are a perfect way to change the look and feel of a room without spending a fortune. Crafted from the Blossom Lane designer fabric collection designed by Wendy Bentley for Timeless Treasures, the front features the Geometric Floral in Citron. Thank you for visiting my Bio page. Believe it or not my background is actually in science. I was an environmental toxicologist for over 11 years and have taught secondary science for over 9.5 years. Many years ago my youngest son was diagnosed with mild cerebral palsy resulting from a prenatal stroke. What a blessing his condition was diagnosed early! However, it became increasingly difficult to meet my teaching obligations and take my son to his physical and occupational therapy appointments (twice a week, two hours roundtrip for each visit), doctor’s appointments, etc. So in June 2006, I “retired” from teaching to be with my son. During all of this time I also owned two antique shops and a gift shop. So within a couple of months of retiring from teaching, I was looking for something I could do from my home studio to stay busy and bring in some extra income. My mother taught me (and my daughter) to sew at an early age and I have been crafting for as long as I can remember. I collect handmade papers and fabrics–although I usually don’t have a project in mind when I buy them. (LOL You sewers and scrapbookers with a stash that is taking over your living space understand what I mean!) I also love vintage and antique linens, porcelain, china, flowers, tea time etc. So in October 2006 I opened Sew Graceful. With time it became apparent that I needed two different Etsy boutiques. Sew Graceful on Etsy has been converted over to all handcrafted and vintage textiles. My sister Etsy site, fabricsboutique, now has all of the fabrics, trims, and patterns that I carry. I want to thank each of you for your support of Sew Graceful and fabricsboutique. Every purchase you make is truly appreciated as it allows me to work from my studio and have the flexibility and time I need to devote to my business and my son. Thank you for taking the time to read about me. I would love to hear from you! Here is another cute creation by Bluecalla. To get all the details about this Toddler Backpack, price, measurements check out Celine’s site at Etsy. 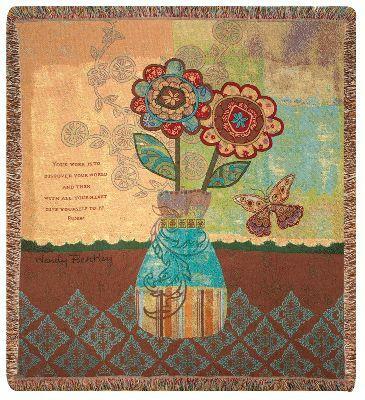 To find Blossom Lane made by Timeless Treasures, check your local quilt shop first & if it isn’t available, go to myLicensees & Retailers page for on-line stores near you.